probably my second favorite Volition title behind Red Faction Guerrilla. Not Freespace 2? You monster! I always forget they made that! They’ve created some truly terrific games. I’ve been meaning to get back to this to 100% it, which involves finishing up some of the map challenges and playing the missions at harder difficulty levels. For a bunch of the missions, I would get impatient at some puzzle battle or boss fight, so I would just crank it down to easy difficulty and plow through. Now I need to go through and play them fair and square. The world’s bright and beautiful, and I really love how unique each of the characters feels to play. The lack of checkpoints for the final, three-stage boss fight made for a very frustrating end to a great game. If I didn’t have characters with the cloaking ability in my party, I don’t know if I could’ve finished it. Thank God for Rama and Scheherazade! Scheherazade is seriously the best. I played about an hour of it, bounced off it pretty hard. I stopped when I got a game-breaking bug to talk to Gremlin to advance the first mission to get Rama and the quest bugged out as Gremlin would not speak to me. How did that miss QA? Mediocre. I hate to be that guy, but as the resident Agents of Mayhem apologist, I feel compelled to say I ran into no game-breaking bugs. Furthermore, Gremlin was always happy to speak to me! I’ve been playing it all week (after putting down a couple years ago at 44% campaign completion). 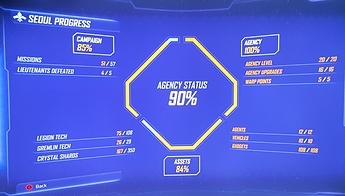 I finished leveling all my Agents up to 20 today, did my first Moscow mission, and got my first 3 Elite Legion Techs. I went into this game blind, so all that stuff was new to me. I’m currently clearing all the global conflicts again so I can get elite techs for 3 more Agents, and in the mean time I’m clearing out Dark Matter fracking stations and the stronghold dungeon things trying to get the rest of the standard Legion Techs I’m missing for some agents. Right now my favorite Agents are Rama the Archer, ONI the mob hitman, and Daisy the revolting chain-gunner. I’d mod out all of Daisy’s dialogue if I were playing on the PC. Far be it for me to say you can’t enjoy the game, Tom, but Immortan Joe would like to have a word with you. Jokes aside, this seemed jankier than Crackdown 3 - I find the movement less fluid, and the camera angles are all kinds of weird and it’s hard to get any sense of situational awareness. Just not my cup of tea but I’m glad you and others enjoy it. Right now my favorite Agents are Rama the Archer, ONI the mob hitman, and Daisy the revolting chain-gunner. I do intend to go back into this to 100% it at some point. I find myself playing things like Far Cry or Anthem or Metro and wondering why I’m not just playing Agents of Mayhem. Yea, I did level her up this week, and her profile pic did look strangely familiar. Having it stare at me was a bit unsettling for reasons I couldn’t explain. My favorite ability of hers is the Teleport Jump passive that augments her melee, but I tend to get murdered to death every time I get within striking distance of anything bigger than a Swarmtrooper, so I didn’t enjoy hacking away with her main 3-attack combo as much as I probably could have. I need to practice with her more to fully appreciate what she does. I don’t have the DLC characters at the moment (Gat and the other two), and I haven’t decided if I want them yet. I’d love for a DLC that introduces new enemy types or Lair/dungeon tile sets, but I know that’s never going to happen. I was a bit surprised (and kind of annoyed because of how much grinding I tend to do before advancing campaign quests in games like this) to see new enemy types appear in the open world after I unlocked them in the campaign (I’m now at 51/57 missions completed I think). I would like to have had those earlier, by unlocking through leveling up or just by raising the difficulty. But at least I’ve got them now. I managed to do a few more campaign missions tonight. I enjoyed the Harley Quinn maps and story arc. I’m never a fan of boss fights, so those weren’t my thing, but I did enjoy the mental abuse she tried to put me through as I traversed her lairs. I especially liked some of the verbally abusive teddy bear chicken things (or whatever they are). They all sounded like a pissed off Chucky dolls trying to front 90s death metal bands. And their dialogue was hilarious. I wish do wish certain minions were easy to pick out of the pack, some of them look too similar (the Buffadins especially). And I wish the Invulnerability aura was easier to distinguish from Vulnerability before I waste shots. Restarted the mission and managed to get past the bug this time. I have to say, it’s got a lot more personality than Crackdown 3, but I still think picking up a tank to throw it at someone is a missed opportunity in AoM. I just joined the 6% club. 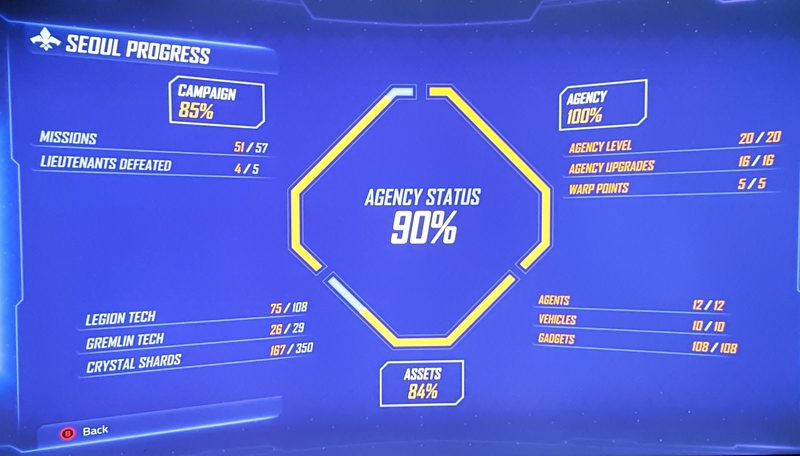 That being the 6% of Agent of Mayhem owners on Xbox that stuck with the game long enough to finish the campaign. Everything else has been unlocked, leveled up, completed, and collected except for 144 Crystal Shards I don’t care about. If I ever decide to log back in and spend a couple days wandering around the city looking for shards, maybe I’ll find out if there’s an achievement for 100%ing the game. If I ever do return, it will be because I decided to pick up the 3 DLC characters and run through Legion Lairs. I had to stop watching that because it was just going to make me start playing Agents of Mayhem again.